I am very pleased to be on these hallowed grounds of my alma mater, the place where it all began, culminating in the position I hold today, that of the Minister of Finance- a position not without its fair share of headaches and heartaches but, equally, rewarding. Rewarding in the sense that it gives me pleasure when I can be part of something that is aimed at improving the lives of Guyanese. This is what this Government, your Government that you elected over a year ago, is committed to doing. Today’s occasion is a simple, yet important, one in the life of students and the University. Today, we meet to officially declare open this spanking new building, the new home of the Student Loan Agency. As we all know, the Agency has been temporarily housed, since 1994 – when fee-paying at the University was re-introduced – in a building provided by the University. By way of a bit of history, that building previously housed the project office of Sub Component A of the Human Resources training and Development Loan, which was financed by the IDB to the tune of US$14.4 million, with counterpart financing of US$1.6 million being provided by the Government. The University of Guyana got the bulk of the resources, over US$11 million. That building served its purpose. However, after 22 years of occupation by the Student Loan Agency, the attendant wear and tear, which was unmatched by the necessary maintenance, has taken its toll. In addition, the need to adequately service a growing student population in a comfortable, friendlier, more inviting atmosphere became an imperative whose time could no longer be postponed. And so, if my memory serves me right, in or around the third quarter of last year, after a meeting with the then UGSS President – I believe his name was Mr. Griffith – who pleaded with me for the Government to do something about the Student Loan Agency, I pledged to provide a new building. I had a conversation with the then Vice Chancellor, Professor Opadeyi, who was immediately receptive to making available, a piece of land for the construction of the building. I then instructed the then Chief Planning Officer, Clyde Roopchand – who has since deceased – to assemble a team to bring the project to fruition. Overseen by a young engineer of the Ministry of Finance, Mahendra Vanbrook, the project has been finally realised. Not only will the staff be housed in more habitable premises but the students, past and present, and other users of the services of the Agency could be assured of a more pleasant atmosphere. I ask that the building be used for the purposes intended, and that due care is taken to preserve the edifice for many years. Following concerns about the high delinquency rate of borrowers of the Student Loan Agency (SLA), an audit into its operations was commissioned and submitted to Cabinet for a review. The report, which was prepared by H. L. B. R. Seebarran and Company, identified a number of deficiencies in the SLA and made several recommendations to improve its operational efficiency and the rate of collection of outstanding loans. Cabinet undertook a preliminary review of the report before remitting it to a Cabinet sub-committee for further examination and recommendations. There were wide ranging discussions on the SLA’s operations, its loan portfolio performance, debt collection and recovery, and organizational development, including technological development and capacity building. The Committee agreed that there was need to review the organizational structure, so as to ensure that there is adequate balance between the workload and staffing and the business processes, in order to ensure that operations are in compliance with auditing and accounting frameworks. We also agreed after that documents and records were being improperly stored, that there are problems in accessing the database. We also learnt that the application used by the SLA was archaic; indeed, so was the physical computer infrastructure. This of course, reinforced the need for proper document management and information technology systems. So the commissioning of this building today is certainly a very firm step in the direction of recalibrating the SLA so that it can be more efficient and effective in its mandate. It was also recognized that the Committee should provide some catalyst for borrowers to repay their loans. A 50 percent reduction in the accumulated arrears of interest, if borrowers bring their accounts up-to-date by September 30, 2016. If, however, a borrower defaults, subsequently, the interest so waived will be restored to the borrower’s account. Loans will be given only to Guyanese students resident in Guyana for one hundred and eighty days continuously within a calendar year. Student borrowers must be holders of valid Guyana passports. There will be new requirements for borrowers who wish to switch from one programme to another. Such borrowers must now pay off the full sum of all outstanding loans before accessing a new loan. Letters of Notifications are to be sent to borrowers informing them of their loan balances. These will be sent one month after the loan is issued. In the event of a failure to respond positively by the borrowers, after a reasonable period has elapsed following a demand for payment, the Government will exercise all options to recover the debt, including litigation. Where students cannot be located or have failed to respond to written and oral communication, the SLA will send notification to the guarantors. As part of the strengthened screening process, guarantors will now be required to produce Liability Statements and/or credit reports from the Credit Bureau. The current forms will be reformatted to include an option to change guarantors. Students will now be required to start repayment on or before the one year grace period, once they have secured employment. Consideration be given to a scheme wherein a borrower who serves continuously for five years after graduation, in designated areas away from his/her normal place of resident (for example, a borrower normally resident in Region 4 serving in Regions 1, 2, 7, 8, 9, or 10) can have the entire balance of his/her loan at the end of the five year period written off. The Government has been fulfilling its obligation to provide funds so that students can access loans to finance their education. Students have an equal obligation to repay those funds upon completion of their University education and in keeping with the terms and conditions of their contracts. Otherwise, a Fund that is meant to be revolving, would soon dry up, and future students will be denied an opportunity to fulfill their dreams. The selfish attitude of many borrowers who are in a position to pay, but who refuse to honor their obligations, must not be allowed to derail the Scheme. In putting in these measures, we do not want to make life hard or difficult for any student. But, we would be irresponsible, nay derelict in our duty as a Government, if we allow hard-earned tax payers money to be frittered away in high delinquent rates and low recovery ratios. Earlier, I spoke to you about loan that was extended by the IDB for education development. That loan had two other Subcomponents, B & C, one of which was targeted to assisting eligible persons to pursue postgraduate training overseas. That in essence was the first Student Revolving Loan Fund. But, sad to say, it never revolved because the borrowers did not repay their loans. History is repeating itself at a higher level. Luckily, the indifference paid in the past to managing the Student Loan Agency and collecting past due debts has been arrested. With these new measures, we hope that both current, past and future students will develop a culture of honoring their obligations. For what is a nation, whose soul is populated by the recalcitrant and the disinterested. Mr Chairman; Fellow Ministers of Government, Ambassador to the European Union Mr. Jernej Videtič, Other Members of the Diplomatic Corp; Special Invitees; Members of the Press; Ladies and Gentlemen: Thank you for being a part of this symbolic, but important signing ceremony. You would appreciate that, as Minister of Finance, I will always be most pleased and happy to participate in proceedings where new or additional financial resources are being made available to the country. This is especially so at a time when Britain’s vote to exit the European Union (Brexit) has sent shockwaves through the international community while creating uncertainty, fear and distress as to future relations between the European Union and the Caribbean, on the one hand, and between Britain and the Caribbean, on the other. Guyana has always valued its relationship with the European, one of the largest donors to the country. From the Lome and Cotonou Agreements to the present Economic Partnership Agreement, our country has received significant support under the various financial facilities, not least among them the National Indicative Programme and the Regional Indicative Programme. The Government of Guyana (GoG) has benefitted from a number of European Union (EU) support projects and programmes, in varying sectors of the economy, over the years, with the Sea and River Defence sector consuming the bulk of the resources. In fact, outside of the Caribbean Development Bank (CDB), I believe it would be fair to say that the European Union is the only active donor in the sector. The EU’s partnership with the Government in this sector dates back to the 4th EDF in the late 1970s. Since the 7th EDF programme, which was signed in February 1994, the EU has contributed over 65 million Euros (nearly G$14 billion at current prices) towards the construction, rehabilitation and/or maintenance of approximately 35 km of sea defence structures in Regions 2, 3, 4 and 6. This has occurred at a time when climate change and other factors have aggravated a sea defence system that is severely stressed and compromised. We have canvassed a number of donors to support investment in this critical infrastructure, even as we roll out our strategic programme to link the hinterland with the coastland. This is in recognition of the fact that, on its own, the Government will not be able to mobilize the huge financial resources necessary to build climate resilient infrastructure to push back the ramparts of the sea. So we will have to depend on friendly donors, like the EU. Each EDF programme has had its specific areas of focus. For example, whereas the 7th and 8th EDF focused on rebuilding critical sections of the sea wall, the 9th EDF provided a programme of sustainable maintenance coupled with capacity building and institutional strengthening to develop local management capacity in the Sea Defence Sector. The current 10th EDF will provide a total of 9.705 M Euros, through a Sector Budget Support Programme, which is linked to a number of target indicators relating to policy development, capacity building and risk-informed investment planning. Our emphasis on the Sea and River Defence sector continues through the 11th EDF programme. The bulk of the 30M Euros is earmarked for this sector. Among the activities that will be pursued are the harmonisation of the legal framework, development of updated disaster risk management (DRM) policies and enhanced coordination of sector agencies. It also accentuates the fact that flood protection policy implementation requires the continued implementation of a robust risk-informed Sea and River Defence investment plan complemented by increased drainage capacity in critical flood risk areas. I do not want to give the impression that the EU gives away money easily. On the contrary, though grants, we have had to work hard to achieve certain set targets, before being eligible for the disbursement of these resources, under the 10th EDF programme. Among the conditions to be satisfied were a stable macro-economic position and satisfactory progress in the implementation of credible and pertinent reforms to improve Public Financial Management – all being essential parts of the development process. Since coming into Office, in May 2015, the Government has developed and embraced a PFM Action Plan and has publicised both the PFM Action Plan and a Budget Transparency Action Plan (BTAP) on its information website. Significant progress has been made since then and by December 2015, we had already recorded a 72 percent achievement rate of all critical indicators outlined in this plan. The most notable improvements were the quarterly exchanges that have begun between the Office of the Auditor General and the Ministry of Finance which would see great improvements in the Government addressing a number of the concerns of the Auditor General in his annual reports and the significant strides made at the Guyana Revenue Authority to broaden the tax base and improve the efficiency and equity in tax collection. Outside of the PFM Action Plan and the Budget Transparency Action Plan, the Government has shown and continues to show commitment to ensuring transparency in the operations of the government sector, and has been transferring, since 2015, the funds earned from the Lottery to the Consolidated Fund. In addition, a number of dormant accounts as well as those which were operated in parallel with the Consolidated Fund (the Government’s chief bank account) have been closed and the monies transferred to the Consolidated Fund. Further, over 50 forensic audits have been conducted, indicating widespread fraud, corruption and mismanagement of resources under the previous regime. These audits are being studied with a view of pursuing administrative and/or legal options. Under tremendous pressure last year, we were able to present the budget well in advance of the deadline. A mere five months after that presentation, the 2016 Budget was presented in January 2016, the earliest in recent history. it was welcomed with relief by all stakeholders, particularly the Line Ministries and the private sector, which were in a better position to plan and manage their affairs over a longer period, instead of the truncated budget year inherited from the previous administration. And, as disclosed by His Excellency President Granger, we intend to go one step further to restore budgeting to its rightful place in the management of public resources, when we will attempt to present the 2017 budget in December 2016. I may add that not only is this the intent of the Constitution and a requirement of the Fiscal Management and Accountability Act, but it is also one of targets of the PFM Action Plan referred to earlier. Steady progress has been made to improve transparency in public procurement practices. This is in recognition of the fact that clear, consistent and transparent procurement processes are at the heart of anti-corruption measures and building people’s confidence in their government. The principles of procurement, which underpin law-based governance, begin with competitive and open bidding processes and end with public access to audits and other information about procurement Thus, very early in the life of our Government, we established a new National Tender Board, increased the tender limits, expanded the pool of evaluators, among other initiatives. In addition, the Public Accounts Committee (PAC) has taken steps to set up the Public Procurement Commission (PPC) which will further develop a greater level of transparency and efficiency in the public procurement process. More recently, the Government moved to establish the Bid Protest Committee, mandated by Article 52 of the Procurement Act. This Committee has been set up to address complaints of alleged wrong doing in public procurement (of the kind referred to in yesterday’s Kaieteur News). You would have noticed that the procedures governing the operations of the Committee were elaborately spelt out in an advertisement in yesterday’s Stabroek News, and was the subject of a news item in today’s Stabroek News. On wider PFM issues, the Government has announced a menu of measures to improve accountability and transparency, including the introduction of Anti Money Laundering legislation, the introduction of a Ministerial Code of Service, and the resuscitation of the Integrity Commission. Let me close by expressing my satisfaction with the current programme and what it has delivered to the sector to date. This is a further demonstration of the strength and value of EU/Government of Guyana relations. That, notwithstanding, quite a lot of work remains to be done and with the continued and committed support of partners like the EU, I have no doubt that we will face the future with less trepidation. Thank you! Thank you for being a part of this symbolic, but important signing ceremony. You would appreciate that, as Minister of Finance, I will always be most pleased and happy to participate in proceedings where new or additional financial resources are being made available to the country. This is especially so at a time when Britain’s vote to exit the European Union (Brexit) has sent shockwaves through the international community while creating uncertainty, fear and distress as to future relations between the European Union and the Caribbean, on the one hand, and between Britain and the Caribbean, on the other. Guyana has always valued its relationship with the European, one of the largest donors to the country. From the Lome and Cotonou Agreements to the present Economic Partnership Agreement, our country has received significant support under the various financial facilities, not least among them the National Indicative Programme and the Regional Indicative Programme. The Government of Guyana (GoG) has benefitted from a number of European Union (EU) support projects and programmes, in varying sectors of the economy, over the years, with the Sea and River Defence sector consuming the bulk of the resources. In fact, outside of the Caribbean Development Bank (CDB), I believe it would be fair to say that the European Union is the only active donor in the sector. The EU’s partnership with the Government in this sector dates back to the 4th EDF in the late 1970s. Since the 7th EDF programme, which was signed in February 1994, the EU has contributed over 65 million Euros (nearly G$14 billion at current prices) towards the construction, rehabilitation and/or maintenance of approximately 35 km of sea defence structures in Regions 2, 3, 4 and 6. This has occurred at a time when climate change and other factors have aggravated a sea defence system that is severely stressed and compromised. We have canvassed a number of donors to support investment in this critical infrastructure, even as we roll out our strategic programme to link the hinterland with the coastland. This is in recognition of the fact that, on its own, the Government will not be able to mobilize the huge financial resources necessary to build climate resilient infrastructure to push back the ramparts of the sea. So we will have to depend on friendly donors, like the EU. Each EDF programme has had its specific areas of focus. For example, whereas the 7th and 8th EDF focused on rebuilding critical sections of the sea wall, the 9th EDF provided a programme of sustainable maintenance coupled with capacity building and institutional strengthening to develop local management capacity in the Sea Defence Sector. The current 10th EDF will provide a total of 9.705 M Euros, through a Sector Budget Support Programme, which is linked to a number of target indicators relating to policy development, capacity building and risk-informed investment planning. Our emphasis on the Sea and River Defence sector continues through the 11th EDF programme. The bulk of the 30M Euros is earmarked for this sector. Among the activities that will be pursued are the harmonisation of the legal framework, development of updated disaster risk management (DRM) policies and enhanced coordination of sector agencies. It also accentuates the fact that flood protection policy implementation requires the continued implementation of a robust risk-informed Sea and River Defence investment plan complemented by increased drainage capacity in critical flood risk areas. I do not want to give the impression that the EU gives away money easily. On the contrary, though grants, we have had to work hard to achieve certain set targets, before being eligible for the disbursement of these resources, under the 10th EDF programme. Among the conditions to be satisfied were a stable macro-economic position and satisfactory progress in the implementation of credible and pertinent reforms to improve Public Financial Management – all being essential parts of the development process. Since coming into Office, in May 2015, the Government has developed and embraced a PFM Action Plan and has publicised both the PFM Action Plan and a Budget Transparency Action Plan (BTAP) on its information website. Significant progress has been made since then and by December 2015, we had already recorded a 72 percent achievement rate of all critical indicators outlined in this plan. The most notable improvements were the quarterly exchanges that have begun between the Office of the Auditor General and the Ministry of Finance which would see great improvements in the Government addressing a number of the concerns of the Auditor General in his annual reports and the significant strides made at the Guyana Revenue Authority to broaden the tax base and improve the efficiency and equity in tax collection. Outside of the PFM Action Plan and the Budget Transparency Action Plan, the Government has shown and continues to show commitment to ensuring transparency in the operations of the government sector, and has been transferring, since 2015, the funds earned from the Lottery to the Consolidated Fund. In addition, a number of dormant accounts as well as those which were operated in parallel with the Consolidated Fund (the Government’s chief bank account) have been closed and the monies transferred to the Consolidated Fund. Further, over 50 forensic audits have been conducted, indicating widespread fraud, corruption and mismanagement of resources under the previous regime. These audits are being studied with a view of pursuing administrative and/or legal options. Under tremendous pressure last year, we were able to present the budget well in advance of the deadline. A mere five months after that presentation, the 2016 Budget was presented in January 2016, the earliest in recent history. it was welcomed with relief by all stakeholders, particularly the Line Ministries and the private sector, which were in a better position to plan and manage their affairs over a longer period, instead of the truncated budget year inherited from the previous administration. And, as disclosed by His Excellency President Granger, we intend to go one step further to restore budgeting to its rightful place in the management of public resources, when we will attempt to present the 2017 budget in December 2016. I may add that not only is this the intent of the Constitution and a requirement of the Fiscal Management and Accountability Act, but it is also one of targets of the PFM Action Plan referred to earlier. Steady progress has been made to improve transparency in public procurement practices. This is in recognition of the fact that clear, consistent and transparent procurement processes are at the heart of anti-corruption measures and building people’s confidence in their government. The principles of procurement, which underpin law-based governance, begin with competitive and open bidding processes and end with public access to audits and other information about procurement Thus, very early in the life of our Government, we established a new National Tender Board, increased the tender limits, expanded the pool of evaluators, among other initiatives. In addition, the Public Accounts Committee (PAC) has taken steps to set up the Public Procurement Commission (PPC) which will further develop a greater level of transparency and efficiency in the public procurement process. More recently, the Government moved to establish the Bid Protest Committee, mandated by Article 52 of the Procurement Act. This Committee has been set up to address complaints of alleged wrong doing in public procurement (of the kind referred to in yesterday’s Kaieteur News). You would have noticed that the procedures governing the operations of the Committee were elaborately spelt out in an advertisement in yesterday’s Stabroek News, and was the subject of a news item in today’s Stabroek News. On wider PFM issues, the Government has announced a menu of measures to improve accountability and transparency, including the introduction of Anti Money Laundering legislation, the introduction of a Ministerial Code of Service, and the resuscitation of the Integrity Commission. Let me close by expressing my satisfaction with the current programme and what it has delivered to the sector to date. This is a further demonstration of the strength and value of EU/Government of Guyana relations. That, notwithstanding, quite a lot of work remains to be done and with the continued and committed support of partners like the EU, I have no doubt that we will face the future with less trepidation. Ladies and gentlemen: Welcome to our breakout session, “The Role of the Debt Management Office”. First, I would like to thank the World Bank Debt Management Facility (DMF) for organising and sponsoring this Forum, which gives us an opportunity to come together and discuss a topic that is crucial to our countries’ future growth and development. I would also like to thank our hosts, the Government of Zambia, for welcoming us to their beautiful country. I am honoured to be joined in this panel discussion by Mr. Zsolt Bango, Head of the Treasury Department, Government Debt Management Agency of Hungary; Ms. Lilia Razlog, Senior Debt Specialist, World Bank Group, and Ms. Rekha Warriar, Chief General Manager of the Internal Debt Management Department of the Reserve Bank of India. I will open our session with some short comments on the Role of the Debt Management Office in Guyana. I will then turn the floor over to my distinguished fellow panellists for their comments. We will conclude with a question and answer session. As we are aware, debt management offices in developing countries play the critical role of ensuring that our governments can raise the funds we need to invest in sustainable growth and development, at the lowest possible cost within an acceptable amount of risk. They must guide borrowing so as to reduce their country’s vulnerability to domestic and external shocks. History has shown that no economy is immune from financial crisis, but this role is especially important for small, emerging market economies, which are often less diversified, have a smaller base of domestic financial savings, and may be more susceptible to global shocks or financial contagion. The case of Guyana illustrates the importance of a good debt management office, by showing how a burdensome debt can be a drag on the economic growth of a country for years—and how development can blossom under a sustainable debt strategy and good economic management. After being declared ineligible to draw on the resources of the IMF and World Bank , in 1982 and 1983 respectively, Guyana embarked on a bold and innovative recovery programme involving the implementation of tough economic reform measures, and negotiating substantial debt forgiveness and restructuring with external creditors. After repeated rounds of debt cancellation and rescheduling, the external debt returned to sustainable levels in the early 2000s. Guyana is now faced with the challenge of maintaining debt sustainability in a volatile and uncertain global economy. Our Debt Sustainability Analyses indicate that Guyana remains vulnerable to external shocks. Commodity price fluctuations have added to the volatility of our export earnings and tax revenues, as well as the financial performance of state-owned agricultural enterprises. Borrowing has also become more uncertain. Guyana recently graduated to Lower Middle Income status, and concessional lending has become scarcer. To access affordable financing, Guyana has sought out alternative funding sources, especially from our South-South partners such as EXIM Bank of China, EXIM Bank of India, the Mexican Agency for International Cooperation and Development, and the Islamic Development Bank. At the same time, we sought to maintain close ties with the multilateral agencies (World Bank, IDB and CDB) and our more traditional western bilateral donors. Because of these developments, Guyana’s debt portfolio and the risks associated with it are becoming more complex. It is increasingly important for us to have sufficient capacity to develop and implement a sophisticated, comprehensive debt strategy. It is recognized that a fully functioning and effective debt management office must perform several functions, with its core responsibility being to develop and implement a comprehensive debt management strategy consistent with a country’s macroeconomic and development goals. To effectively accomplish this objective, a debt management office must be well organised and must perform certain key functions. These resourcing, analytical, and accounting functions (which are typically described as front office, middle office, and back office functions) should, for efficiency and effectiveness, be centralized within the debt office. All these functions support the overarching mandate of developing and implementing a sustainable and comprehensive debt management strategy. Front office functions tend to focus on mobilizing resources and engaging with donors, lenders, and borrowers. These functions include negotiating aid and signing agreements, issuing securities, conducting auctions, on-lending, and issuing loan guarantees. Middle office functions are focused on analysis and policy development, and include analysing debt and risk, and developing policies and strategies for borrowing, on-lending, and guarantee issuance. They also include reporting debt to the public. Back office functions include administering debt payments, and maintaining records of debt data. Guyana’s Debt Management Division (DMD) was formally established in 1986 as the central agency within the Ministry of Finance, to manage all of the country’s external public debt. By being placed within the Office of the Budget of the Ministry of Finance, the DMD facilitated improved coordination with departments responsible for fiscal operations and macroeconomic programming. This, notwithstanding, debt functions remain fragmented, resulting in duplicated functions and ineffective coordination. For example, although the DMD is recognized informally as the lead agency on debt management, it is currently not formally responsible for aid coordination and the registry of grants. Therefore, it is not able to monitor all forms of aid that Guyana receives. It does not have a comprehensive database of all aid inflows into Guyana and has no mandate to undertake such an exercise. Also, because new loans are predominantly negotiated by other departments/divisions, the DMD is not always able to analyse and review new facilities prior to their negotiation and, therefore, may not be able to monitor the new financing ceilings and limits in respect of public debt management. The DMD is only responsible for some front office functions. Though it is responsible for external debt, the DMD does not issue or record domestic Treasury bills, nor does it record and monitor grant aid, although it is ultimately responsible for analysing and developing policy for these financing sources. Treasury Bills are issued and monitored by the Bank of Guyana, which is also responsible for issuing domestic debt securities and conducting auctions for them. The DMD has no say in the tenor, timing or size of the issues even though the government ultimately services this debt. Grant aid is monitored and recorded by the Project Cycle Management Division of the Ministry of Finance. Front office functions are managed by the Project Cycle Management Division, with input from the DMD, the Ministry of Foreign Affairs, and the Ministry of Legal Affairs. The Project Cycle Management Division plans all government borrowing, and works with the other agencies to negotiate and contract loans and grant aid. The DMD is also responsible for performing middle office and back office functions related to public debt (except Treasury Bills). The DMD is responsible for performing those middle office functions related to developing a debt management strategy as well as assuming the responsibility of undertaking debt sustainability analyses. Substantial reforms are needed to place debt strategy formulation and implementation at the forefront of debt management activity and economic policy-making. 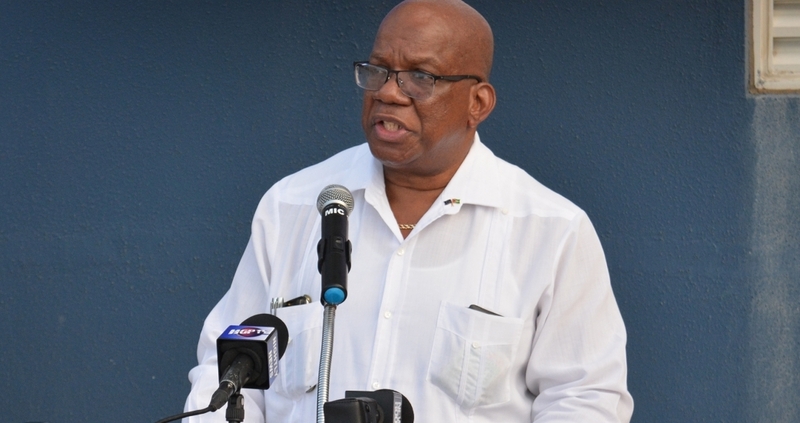 The DMD is also responsible for servicing the public debt and monitoring and managing Guyana’s debt, including maintaining an inventory of all public and publicly guaranteed external loans, and recording loan by loan data in the Commonwealth Secretariat Debt Recording and Management System (CS-DRMS). These back office functions are the current mainstay of the debt management unit and there is strong capacity in this regard. In spite of this, debt recording is not sufficiently comprehensive and still does not fully include the capture of domestic debt. Thus, obtaining a holistic view of the public debt is still a work in progress. 1. Strategy Formulation: The real focus of a debt management office should be developing and implementing a medium-term debt management strategy. This requires staff with a strong understanding of how to formulate debt strategy, including designing a Medium Term Debt Strategy (MTDS). Increasingly, this also requires the ability to analyse complex financial instruments. Debt management staff must understand financial conventions, financial market calculations, and the mathematics behind the instruments being contracted. They must be able to conduct cost-benefit analyses that allows us to make smart decisions when faced with a menu of instruments or borrowing terms. 2. Self-Assessment: A modern debt management office should not have to rely solely on external reviews to guide its improvement. We need to master the use of self-assessment tools, such as the Debt Management Performance Assessment (DeMPA), so that our debt management teams can be more proactive in identifying and remedying weak areas in debt management operations and in the institutional framework for public debt management on our own. 3. Operational Risk Management: We give a lot of attention to managing debt risk, but our internal operations must be robust as well. Debt management offices are responsible for recording debt data, instructing debt payments, and storing loan agreements. Storing information non-systematically, or only in paper form, puts us at risk for data loss. For example, many of Guyana’s government institutions are housed in wooden heritage buildings. While beautiful, these facilities could be devastated by fire or flooding. When Guyana’s Ministry of Finance Annex was burnt by fire several years ago, important grant and tender board documents were destroyed, and information was lost. We must improve records management and data storage to avoid such losses, by improving our systems and taking advantage of new technology. In effect, we must develop much greater capacity in operational risk management, especially in debt management operations in order to minimise the possibility of loss from system failures, human error and misconduct as well as from natural disasters, such as fires and floods. 4. Negotiations: Every country should be able to borrow on terms that are fair and mutually advantageous and that achieve government’s cost and risk debt management objectives. To do this, we must be able to negotiate well. This requires better understanding of complex borrowing instruments, as well as a trained team of professionals with demonstrated skills in negotiation strategies and techniques. Improving debt management capacity in these four areas will require Guyana to address a number of institutional challenges. The legal framework for debt management in Guyana comes from a patchwork of legislation, much of it outdated, including the External Loans Act (last updated in 1991), the Guarantee of Loans Act (1974), the General Loans Act (last updated in 1984), the Financial Administration and Audit Act (1963), and the Fiscal Management and Accountability Act (2003). Ideally, a debt management legal framework should address authority to borrow, borrowing limits, guarantees, and on-lending arrangements, and establish institutional structures for debt management. Current laws place some limits on government borrowing, and assign general debt management responsibilities to different agencies. However, especially with regard to institutional roles and procedures, the laws do not provide a clear legal framework for Guyana’s increasingly modern and complex debt management. The broad mandates in the current legislation omit specific parameters for contracting, guaranteeing and servicing external and domestic debt. For example, there are no guidelines regarding the issuance and management of guarantees. The existing legal structure also fails to clearly delineate roles, responsibilities and protocols among the agencies that share debt management functions. More importantly, there is no requirement to develop and implement a comprehensive debt management strategy consistent with a clearly articulated view by the government of the portfolio costs and risks it is willing to bear. In addition, there is no requirement under the law to report on debt management performance and whether it has achieved its stated debt management objectives. Attempts to address these gaps have begun. A single Public Debt and Aid Management Act and Regulations, drafted since 2006, is under active consideration. Once enacted, this legislation would combine the current, disparate laws into a single public debt management framework. Borrowing limits would be specified for total public debt (external and domestic) and provide the needed flexibility to borrow in new markets and with new instruments in tandem with the changing financial architecture. The legislation would also establish rules for on-lending arrangements. It would create a legal mandate for the DMD established in the Ministry of Finance, and formalise its role as the lead agency for public debt management. It would also establish domestic debt functions in the DMD. By assigning responsibility for roles, defining debt management objectives, and establishing audit procedures, the legislation would improve the accountability and transparency of Guyana’s debt management. As I previously mentioned, debt management functions in Guyana are highly fragmented and shared among many agencies. The current legal framework does not provide clear guides for roles or coordination, and with the exception of the DMD, the agencies responsible for dent management functions lack formal Terms of Reference delineating their responsibilities. This results in a duplication of tasks, lack of information flow, and hinders the prior analysis of loan terms and the full assessment of on-lending arrangements. The government has worked to address the problem of coordination by increasing the flow of information among agencies. This was achieved through political commitment at high levels to establish procedures for information sharing. However, these procedures have not been formalised in any way. While political will is critical to improving debt management capacity, Guyana’s past experiences have shown that relying on political will alone, without formally codifying procedures in rules or regulations, creates a risk that the procedures will fall by the wayside when political will wanes. Guyana’s Debt Strategy Technical Working Group, which was first convened in 1999, suffered this fate. The Working Group was initially successful, proving instrumental in creating Guyana’s first debt strategy, but subsequently fell away and ceased to meet. To prevent our progress on coordination capacity from eroding, the Ministry of Finance will work with each agency to develop a clear Terms of Reference regarding debt functions. The government also plans to create a Public Debt Management Procedures Manual to specify the functions and linkages of all the institutions, including data and information flows, computer software applications and reporting requirements. These TORs and procedures will give the DMD a mandate to monitor and coordinate all public debt. A further step that will strengthen public debt management is to establish a high-level Debt Policy Committee that provides broad oversight of public debt management and steers debt policy and debt strategy formulation. Ideally, it would be envisaged that the work of the Technical Working Group – the group preparing the debt management strategy and other technical documents – would inform the Debt Policy Committee. Building capacity in debt management has been a challenge for Guyana. In recent years, the tertiary institutions in our region have not turned out enough graduates with quantitative and analytical skills, and high turnover in key positions has also made it difficult to retain the skills and knowledge. The DMD is quite small, currently with a staff of four, so even moderate turnover can quickly reduce its capacity. To address this, Guyana adopting a multi-faceted approach. First, the Ministry of Finance continues to invest in a consistent and comprehensive capacity building plan to develop the skills-set that is required to understand public debt management and its inter-linkages. Given the increasing complexity of public debt management, this is a policy imperative. So far, Guyana has benefitted from assistance provided by partners such as the Commonwealth Secretariat, Debt Relief International (DRI), CEMLA, the World Bank, IDB and the European Union to build capacity for analytical work, including workshops and training DMD staff to conduct Debt Sustainability Analysis and develop a Medium Term Debt Strategy. Second, we need to do more to retain and propagate knowledge and skills within the Debt Management Division, to reduce our reliance on training provided by our external partners. In this regard, the Ministry of Finance is exploring undertaking training for new staff on a semi-annual basis, with experienced staff serving as trainers. Third, the Ministry of Finance is examining ways to attract and retain staff, including reviewing salaries at the national level, as well as developing clear succession plans, challenging staff to produce high quality technical work and, last but not least, using their outputs to inform and strengthen overall national economic policy. The challenges to improving debt management capacity are not new, nor are many of the proposals to address them. Some, like the Public Debt and Aid Management Act, have languished for years. Governments must appreciate the importance of sound debt management. In Guyana’s experience, political will has been critical to improving capacity, such as in the case of improved information flow among debt management agencies. At the same time, lack of political will has allowed our debt management capacity to atrophy, such as when the Debt Strategy Technical Working Group ceased to meet. To meaningfully and sustainably build our debt management capacity, we must be farsighted enough to make investments in our institutions today that could stave off crisis many years down the road. My young government, which turned 1 year old two weeks ago, intends to lead through proactive action, so as to improve Guyana’s performance in sovereign debt management. Guyana’s graduation to Lower Middle Income status, along with volatile global economic conditions, have posed new challenges for debt management, including greater responsibilities for our Debt Management Division. We must give our debt management offices the ability to meet these responsibilities, by continuing to improve our debt management institutions and capacity. These are challenges to which I believe many emerging economies can relate. I, therefore, look forward to hearing the experiences of my fellow panellists, and to having an interactive and productive discussion with this group. Without further ado, I would like to turn the discussion over to Mr. Bango. It gives me great pleasure to be with you, today, on this momentous occasion. Momentous in two senses: first that we are celebrating 50 years of being an independent nation. It was this month, in 1966, that our people, after years of struggle, were finally able to shed the yoke of colonialism and become masters and mistresses of our own destiny. As I said in my 2016 Budget Speech, there is lots for which we should be proud; despite trials and tribulations, difficulties and challenges, we recorded signal successes in every area of endeavour. Fifty years as an independent state is indeed a significant milestone in the history of our country and should be commemorated in unique ways. Which brings us to the second reason why this occasion is auspicious – the launch of a fifty dollar Banknote and two Commemorative coins; a fitting way to expand the country’s numismatic collection while at the same time celebrating our Golden Jubilee of Independence. Just months before our country gained political independence, the Bank of Guyana was established as a part of the new infrastructure that was necessary to facilitate the development process in our country. Our sovereign notes and coins, which were first issued back in 1965, are prominent symbols of our nationhood. The launch of this new banknote and commemorative coins is a fitting reminder of the role of the Bank of Guyana in the development process in Guyana. As the issuer of the country’s currency, the Bank is expected to conduct periodic currency reviews and implement appropriate currency reform to the existing currency structure. the Bank is also tasked with influencing the volume of currency in circulation, actions that are at the heart of controlling inflation and promoting macroeconomic stability. Let me, therefore, hasten to say that the circulation of this new banknote will have no impact on the volume of currency in circulation and will in no way lead to high inflation, since the government has a sound monetary and fiscal policy framework in place to preserve the value of the currency. Ladies and gentlemen, although technology has delivered alternative methods of payments, such as credit and debit cards, mobile money and smart phone apps, Guyana remains a cash- based economy, in which the majority of economic transactions are conducted using cash. Individuals, therefore, carry around large sums of cash which pose a risk to their safety. This fact is exemplified in the spate of robberies over the years. Cash- based economies also face the threat of money laundering activities. The time is, therefore, opportune for the Bank to take a more aggressive approach in their financial literacy campaign, particularly targeting residents in rural communities. I assume that a lot of effort has gone into the production of this new banknote, as consideration had to be given to issues such as quality and design of the note, security features, and timing of introduction and acceptability of the banknote. I want to use this occasion to thank the project team, consisting of the staffs of Bank of Guyana and the Mint of Norway for a job well done. Ladies and gentlemen, the symbols on the commemorative note and coins are distinctively Guyanese. The two Commemorative coins are similar in design. The 50th Independence Anniversary logo, featuring our national animal, the jaguar, is depicted on the reverse side of the coins, while the obverse side features Guyana’s Coat of Arms, one of the original symbols of Independence. The design of the $50 Banknote also celebrates Guyana’s nationhood. It features the 50th Independence Anniversary logo as well as the National Flag, a Map of Guyana and snippets of the National Anthem – the latter being very apt considering the number of people who seem not to know its words. I think it can be rightfully said that this note captures beauty that is uniquely Guyanese. “Onward, upward may we ever go! Day by day in strength and beauty grow. What Guyana’s sons and daughters can be”. The Most Honourable Andrew Holness, Prime Minister of Jamaica; Governors; President of the Caribbean Development Bank (CDB); Vice Presidents; Directors; Distinguished Delegates; Ladies and Gentlemen. Permit me to extend my deepest appreciation to the Caribbean Development Bank (CDB) for its continued collaboration and engagement with the Government of Guyana (GoG). I should also like to use this opportunity to congratulate the Bank’s President, Dr Warren Smith, on his unanimous re-election to a second 5-year term. Through his proven leadership, we are assured that the Bank will continue its commitment to support the development agenda of its Borrowing Member Countries. On May 11, 2015, the people of Guyana ushered in a new Government of a coalition of parties to govern their affairs. This is the first opportunity, therefore, of this coalition of democratic forces to address the Governor’s Meeting, and outline our strategic agenda for development of Guyana and its engagement and partnership with the Bank in pursuit of that agenda. This 46th Annual Meeting of the Board of Governors of the Bank is being held at a time when there is a crisis of confidence and great uncertainty in the global economy. Commodity prices and financial markets remain volatile and concerns have intensified over China’s transition to more sustainable and balanced growth. While recent data and policy actions give rise to renewed hope and expectation, recovery of the global economy remains disappointing. The growth rate is at its lowest since 2009 and future growth has been revised downwards. Into these headwinds have sailed the Caribbean economies, whose vulnerability has been exposed by their openness – characterised by their high import dependence and narrow range of exports. In the case of Guyana, growth of 3% was recorded in 2015 and the forecast for 2016 has been pegged at 4.4%. This compares favourably with the regional forecast for Latin America and the Caribbean of less than 1%. Guyana, which is a commodity dependent country, has a narrow revenue base. As such, like most Caribbean countries, it is operating within inadequate fiscal space and, therefore, has restricted flexibility to re-allocate funds. To expand the fiscal space there will be need to reduce waste and stamp out corruption within the public sector among other measures. We, as a government, have to ensure that our taxpayers’ money is accurately accounted for and spent in the most efficient and productive manner and that we create opportunities for the prosperity of our people, as crafted in our Vision 2020 manifesto. Intrinsic to this strategic trajectory to 2020 and beyond, is the thematic of “A good life in a green economy” underpinned by robust economic growth that is equitably distributed, good governance and environmental sustainability. Guyana Vision 2020 articulates Government’s developmental priorities and central to this is linking the Coastland to the Hinterland through Infrastructural and Social and Human Development. The Government is promoting greater integration between the hinterland and the coastland of Guyana. The hinterland comprises over three- quarters of Guyana’s territory. In order for Guyana to realize holistic, comprehensive and sustainable development, the Government is focusing on bridging the spatial and developmental divide that exists within the country. In this regard, the Government is currently developing four new towns and is examining several other areas for township. They are expected to become thriving economic centres overtime. Secondly, the Government is focusing on developing infrastructure. Non-traditional economic activities, particularly value-added industries, often require more sophisticated inputs than traditional primary industries. They need reliable electricity, water, telecommunications, and the ability to transport inputs and outputs. The country’s Public Sector Investment Programme (PSIP) for 2016 reflects this thrust as Government is investing over 75% of the budgetary allocations in this area. Thirdly, as it relates to renewable energy, the Government continues to pursue a comprehensive energy matrix. It is expected that, by the end of 2016, one of the new towns, Bartica, will become energy self- sufficient with the construction of the first solar energy farm in Guyana. Additionally, the Government has advanced dialogue with investors to establish a 25 megawatt wind farm on the Atlantic Coast of Guyana. Fourthly, the health and education sectors are being re-examined. Building an educated, healthy workforce is crucial towards ensuring that businesses can find employees with the skills required to contribute meaningfully to their vision and mission. To this end, plans are underway to develop a comprehensive technical and vocational programme; modernize the primary and secondary curricula and institutions; and upgrade the educational programme and facility within the University of Guyana. To respond to health issues of the nation including high infant and maternal mortality; pandemics such as Zika and Chikungunya; and incidences of chronic non-communicable diseases; and suicide, the Government is investing significant resources in expanding health care facilities, with emphasis on maternal and child health; increasing the availability of drugs and medical supplies; and intensifying training, among medical professionals. To finance the Government’s ambitious programme, there is need to broaden the tax-base, improve tax collection, develop public private initiatives and expand the role of development partners in financing these projects. In this regard, the Government has recently concluded an assessment of the current tax system. The recommendations are being reviewed with the aim of speedy implementation. New policy guidelines for pursuing Public Private Partnerships are being promulgated, while the business environment is being improved to attract greater foreign and domestic investment. As a founding member of the Bank, we value our relationship with CDB highly. The Bank remains a fundamental development partner in supporting Guyana’s national developmental agenda. In recognition of this, mere months after its accession to Office, the new APNU+AFC Government was extremely pleased to welcome a high-level team, led by the President. Our fruitful engagement led to the rapid preparation of a Mid- Term Review Strategy Paper for Guyana. This Interim Strategy will inform a comprehensive Country Strategy Paper (CSP) for the period, 2017-2020, which will be aligned to our Vision 2020. Within the context of engagement with the CDB, we wish to acknowledge the Bank’s role in developing and implementing the Basic Needs Trust Fund (BNTF) Programme, of which Guyana is a main beneficiary. The BNTF has been a pillar in improving living conditions in rural communities in the country. Community-driven interventions under the programme have assisted in reducing poverty levels through focus on: Education and Human Resources Development; Water and Sanitation; and Community Access Roads. The Government looks forward to the strengthening of the BNTF Programme across the Region. In this regard, the early replenishment of the Special Development Fund (SDF) will signify new hope for the development of catalytic projects which can be designed towards achieving the Sustainable Development Goals and meeting other international milestones. I salute the efforts of the Bank in exploring options for creating easier terms of borrowing within the Special Development Fund. Guyana supports the recommendations of the Bank to reduce SDF lending rates from 2.5% to 1% for Groups 1 and 2 countries, and from 2% to 1% for Group 3 countries. The Government also welcomes the Bank’s options for co-financing and is grateful that the Bank is considering this funding mechanism under the UK-CIF and SDF initiatives. This would contribute to increasing the resource envelope available to Guyana in the form of loan co-financed by a grant element. We are cognisant of the growing CDB portfolio in Guyana and the level of discomfort at the rate of implementation of the projects. We would like to recommend that the Bank reconsiders placing a permanent resident representative in the country. This would release the stress under which the monitoring of the current Investment Portfolio finds itself, as well as improve the efficiency and effectiveness of communication between the Bank and the Government. As the Government completes its first year in office, we look to partners like the CDB to help us build a green and prosperous Guyana in the coming years.